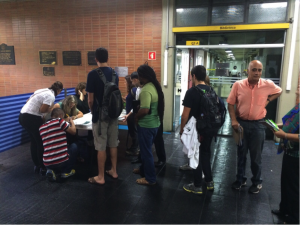 The University of São Paulo, Brazil, celebrated last year's World Fisheries Day on November 21, with an event themed 'Revealing Small-Scale Fisheries - a Day of Art and Culture'. The event consisted of a number of activities, including a launch of the “Revelando a Pesca de Pequena Escala” information booklet, photography exhibition, documentary film festival exhibition, short presentations and a panel discussion. It was organized as part of the project titled 'A global and local action for small-scale fisheries: leaders, communities, scientists/Uma ação global e local para a pesca de pequena escala: lideranças, comunidades, cientistas'. The project facilitated collaborative and inclusive efforts to involve Brazilian fishers in the 2nd Small-Scale Fisheries Congress and in the global discussion about the challenges and rights of SSF. It also promoted scientific contribution that can help solve these issues. For this occasion, special focus was placed on giving a voice to the Arts as a way to transcend academic debate. The documentary film festival showed contemporary themes on the conflicts present in the artisanal fishing communities and territories in Brazil. The short-films showcased the invaluable importance of those communities. Panel session included the discussions about the importance of public, academic, and fisher's organizations in the implementation of the SSF Guidelines, and paid a tribute to USP Prof. Antionio Carlos Diegues (co-founder of ICSF). 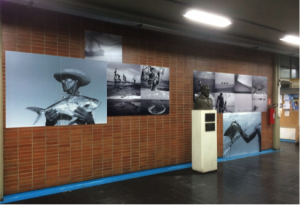 Roberto Linskera, an award winning photographer (National Geographic) presented his “Mar de homens, um recorte” exhibition that included an impressive selection of black and white photos taken during his eight year long project along the Brazilian coast. 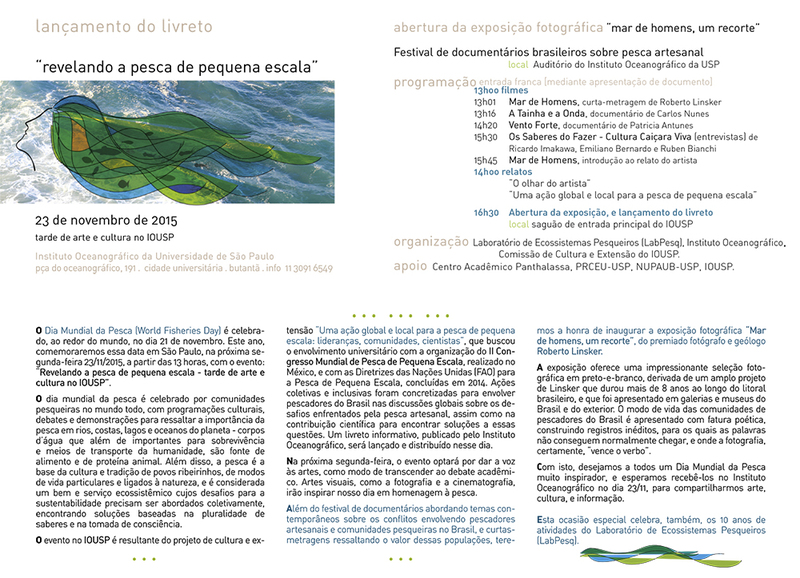 The event was organized by the Fisheries Ecosystems Laboratory (LabPesq), Oceanographic Institute and Comissão de Cultura e Extensão IOUSP. Additional support was provided by Panthalassa Student Union, PRCEU-USP, IOUSP, and NUPAUB-USP.